3 Why are nursing shoes unique? Nursing is a profession that requires you to be on your feet quickly when an emergency suddenly comes up or when you are on your rounds. To last a twelve-hour shift, you need to feel comfortable. Comfort doesn’t just go mean your nurse uniform but also your nursing shoes. In fact, nursing shoes are the most vital equipment for nurses to invest in. With the best shoes for nurses you can find, you can focus more on your work without feeling pain from your feet. For a nurse’s career, aside from doing their job properly, finding the best shoes is vital for healthy feet. A nurse’s feet must be adequately cushioned. The primary qualities that a good pair of shoes must have are comfort, support, and stability. Nurses aren’t immune to pain and injuries just because they know how to nurse them. They’re just as susceptible to pain and injuries as any other person. Being on your feet all day, if you don’t wear proper shoes, you run the risk of pain in your lower limbs, particularly your legs and feet. Examples of these conditions are flat feet, heel spurs, plantar fasciitis, muscle soreness, and arthritis. This article looks at the best shoes for nurses that we could find. Through our deep research on the advantages and disadvantages, we provide the top ten nursing shoes available on the market. Also, we offer you some great advice on how to maintain healthy feet and advice on choosing a good pair of shoes. If you are yet to find the perfect shoes for work, then give these Aerosoles SureGrip women’s work shoes serious consideration. For a perfect package of quality, style and comfort, these shoes are also extremely reasonably priced. Made from high quality leather, you don’t need to sacrifice style for durability. The rubber soles provide excellent traction. Stay safe and stable even on slippery surfaces with these nifty Aerosoles. The perforated uppers allow your feet to breathe while the cushioned footbed and ultra-flat design ensure that your feet stay comfortable and protected from any impact. Next up is another offering from Aerosoles shoes combining style with comfort to give you the best of both worlds. As a nurse, you need shoes that are comfortable, flexible and stable. The patented SureGrip technology incorporated in these shoes is perfect for those who spend a lot of time standing. 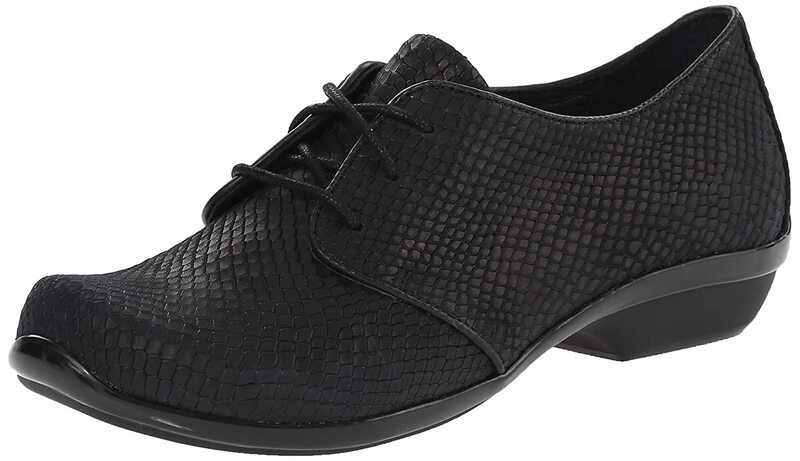 The lace pattern on the shoes is striking and stylish. It is possible to get shoes that look good and perform well if you are standing up all day. The rugged synthetic material, rubber soles and cushioned footbed give you the stability and safety you need when working without hurting your feet. Being a nurse, a profession that demands you to be on your feet a lot, you must ensure that your shoes don’t just look good on your feet but also deliver comfort, superb support and stability on all surfaces. With the Alegria women’s Dayna flat, you’ll tick all these boxes without breaking the bank. With leather uppers and a rubber sole, these shoes will last the distance while ensuring you stay on your feet with no risk of slipping over. With an understated 1.5-inch heel, you can wear your favorite style without feeling the pinch. The shoe’s flat form puts comfort at a premium. Whether you dress these shoes up or down, they will make a versatile addition to your wardrobe. 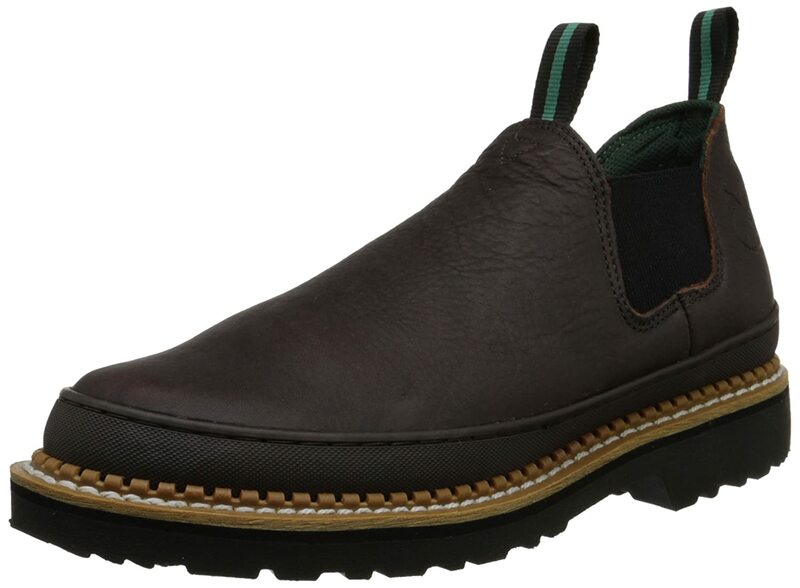 Clarks is a reputable brand who have been producing quality shoes and apparel for decades. These Ashland Violet women’s flats are the perfect mixture of quality, style, and comfort. The uppers are made from top-tier leather known for durability and comfort. The sole is synthetic assuring you of total and uncompromised support. Additionally, the shoes feature a cushioned footbed for added comfort and shock absorption. Some customers complain that the shoes run wide. This is good news for anyone with foot irregularities or deformities requiring a more roomy fit. 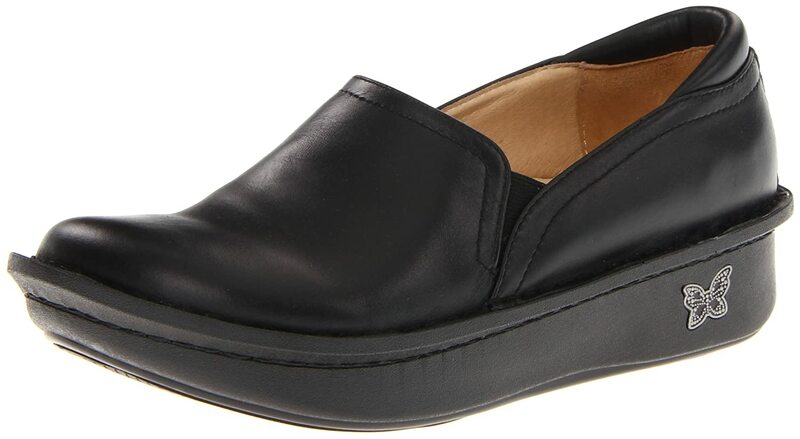 The Cherokee women’s Maggie shoes are a great casual slip-on that can be worn on all occasions but especially for work. 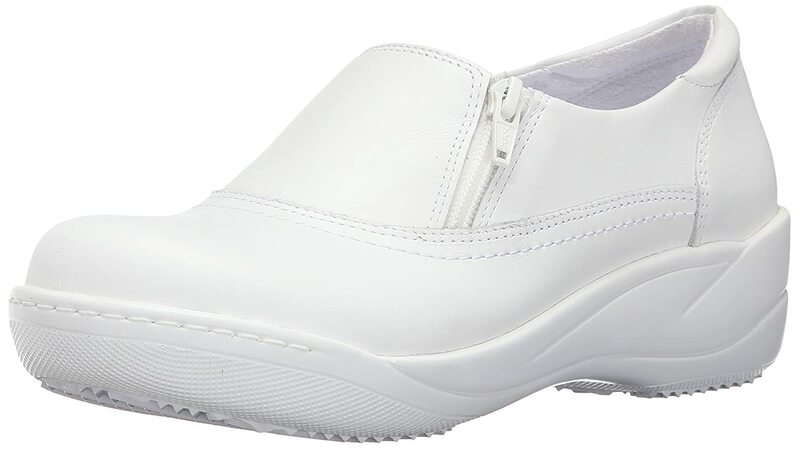 For nurses who stand all day long, these shoes are a worthwhile investment if you want style, comfort, quality and optimal support in one appetizing package. The shoes are made with genuine leather which is very durable and easy to clean. The rubber soles offer the stability you need. Apart from the materials, Cherokee Maggie shoes have slip-resistant technology to protect you from losing your footing on slippery floors. The lining of these shoes is breathable plus it features an EVA midsole which assures you of comfort all day. Another fantastic feature of these shoes is the wicking insole that keeps moisture well away from your feet. 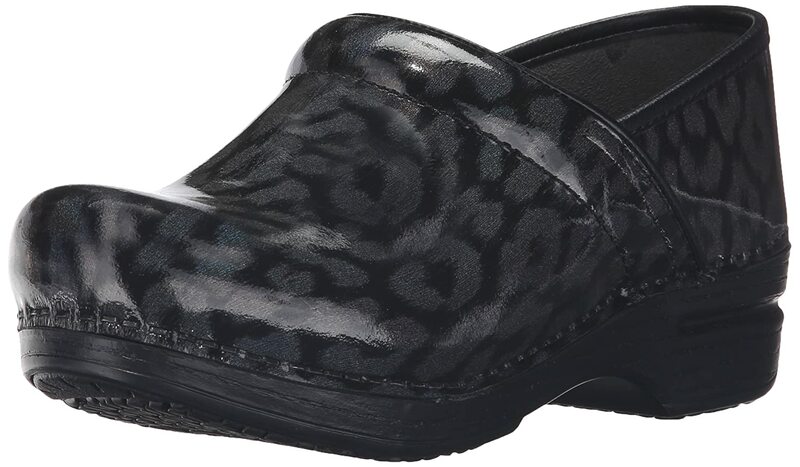 These shoes by Dansko are an excellent choice for nurses looking for shoes to keep them comfortable all day long. Since the nursing profession involves standing and walking all day, it’s critical that you find the best shoes that can keep you comfortable throughout your shift. Made with genuine leather, these Dansko women’s Olive Oxford are designed for comfort, s﻿﻿t﻿﻿ability, and durability. Also, the shoe features a synthetic sole and a 1.25-inch heel which all combine to give you adequate arch support on any floor type. These beautifully designed Olive’s are a round-toe laced Oxford style with a removable polyurethane footbed for comfort and maximum support. These are the type of shoes that gets you through the day without a single slip or any hint of pain. It is no wonder its manufacturers dub it ‘the professional's shoes for convenience, comfort and practicality’. With these shoes, you don’t have to worry about walking on slippery floors. The indoor grip and anti-slip technology helps stop you slipping, even on very wet floors. These shoes have microbes that eliminate bad odor from your feet as a result of sweating. The material is leather, and the sole is rubber for durability and stability. 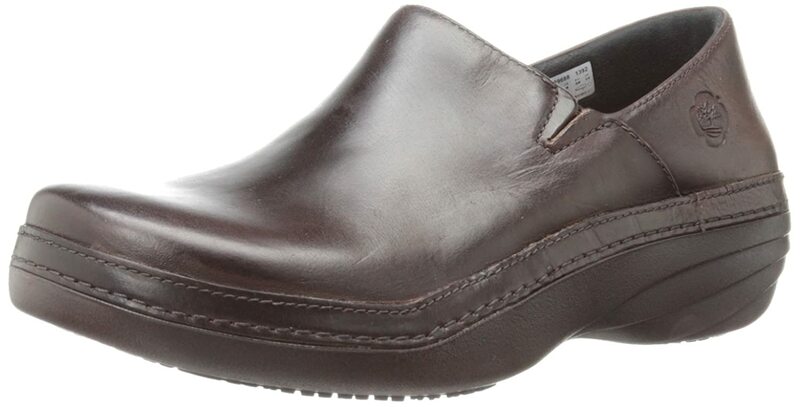 This MOZO women’s work clog is a great pick for all day standing and everyday wear. The shoes look good and can easily be worn with jeans, your work uniform or office wear as the black color complements almost everything. These MOZO clogs feature an all-leather upper that is simple to clean and easy on the feet. The rubber soles give optimal stability when standing. Slip-resistant outsoles stop you from slipping even when working on slippery floors. These clogs are also designed with gel insoles that provide extra cushioning for comfort. 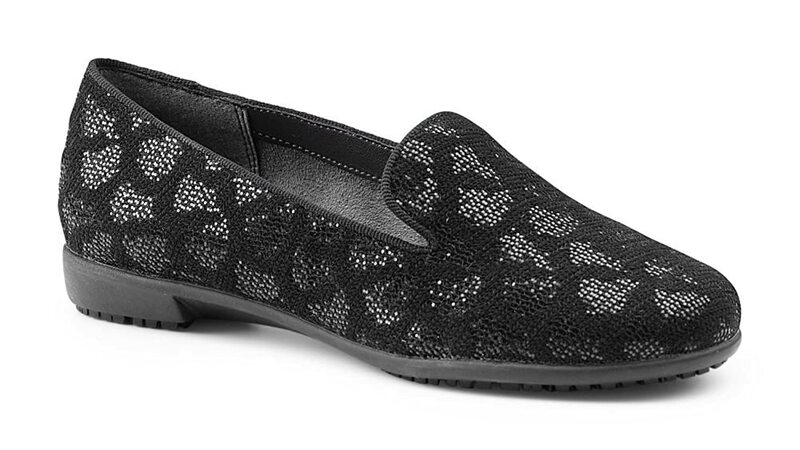 If you wear black flats daily to work and are in need of a new pair, these are a smart choice. The SafeTstep Sasha Quilt Bow flat shoes feature a beautiful quilted design that makes them perfect for most uniformed professions. The shoe can also be worn on a casual day and still look the part. These shoes feature a slip-resistant technology that makes them perfect for rainy days or wet floors. The quilted upper with faux patent accents and mesh lining give these flats a sleek look. With a breathable padded insole, you’ll get all the comfort you need to stand all day. Birkenstock is the go-to brand for quality unisex shoes. These unisex work shoes are tailor-made for anyone standing all day at work. While they are not the cheapest shoes on the market, you are paying for the considerable brand heritage and reputation. In return, you’ll get a wonderful pair of work shoes. Made from highly durable leather, the upper also has a buckle that allows you to tweak the fit to your exact preference. These shoes also feature a unique contoured footbed that provides arch support and molds to the shape of your foot. 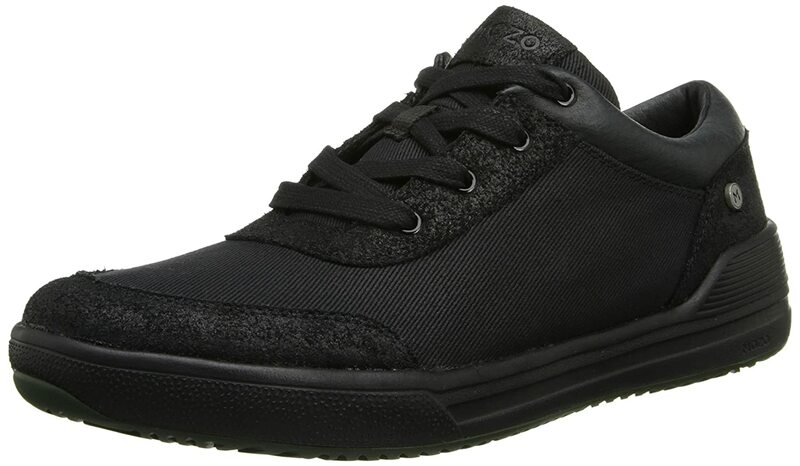 If you want a shoe that will not force you to choose between style and comfort, then you’ve got to try these MOZO men’s Gallant slip resistant comfort lace up shoes. This is a great shoe that will erase painful long-standing days and replace them with superior all-day comfort and support. With MOZO lace-ups, you can happily say bye to sore feet! These shoes are designed for comfort, style, and durability. The rubber soles guarantees excellent traction. The sole also features slip-resistant technology that holds you firm on the ground even when walking on wet floors. Importantly, the shoes feature a unique gusseted tongue that works to keep away moisture and ensures your feet stay dry throughout. These extremely comfortable and waxed canvas sneakers seem to be drawing some very favorable reviews. If you need to work comfortably in an active environment, especially in the health care profession, take a long look at these subtle sneakers. The most notable feature of these canvas sneakers is the waxed canvas upper that makes them suitable for most occasions. The slip-resistant outsole gives you the much-needed grip to withstand slippery floors. The breathable lining helps your feet to breathe and stay fresh all day. Skechers are a brand you can trust for professional work shoes. 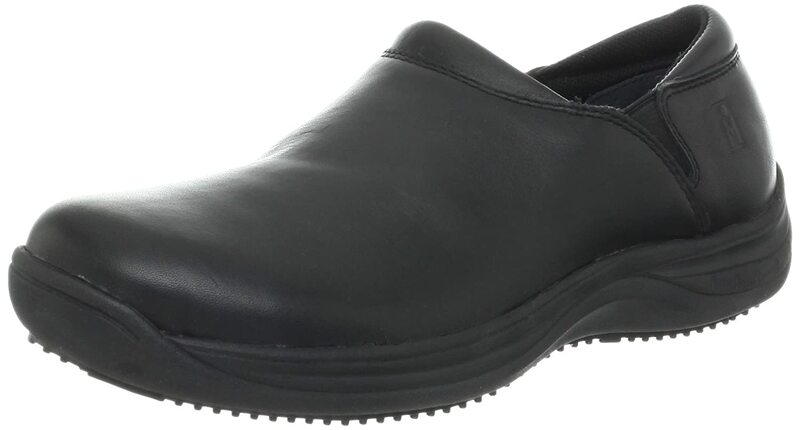 It is no wonder these Skechers for Work Fribble shoes are fast becoming a favorite among many professionals, particularly those in the healthcare and hospitality industry. These shoes are made of leather for durability and easy maintenance. The robust rubber sole translates to excellent traction when walking or standing on any floor. The relaxed fit and removable soles also means the shoes work well in professional environments that require standing for long hours. Skechers is a global powerhouse that has received much acclaim for consistently producing top quality and durable shoes for both men and women. These men’s McAllen slip-ons are no exception to the excellent quality Skechers is known for. 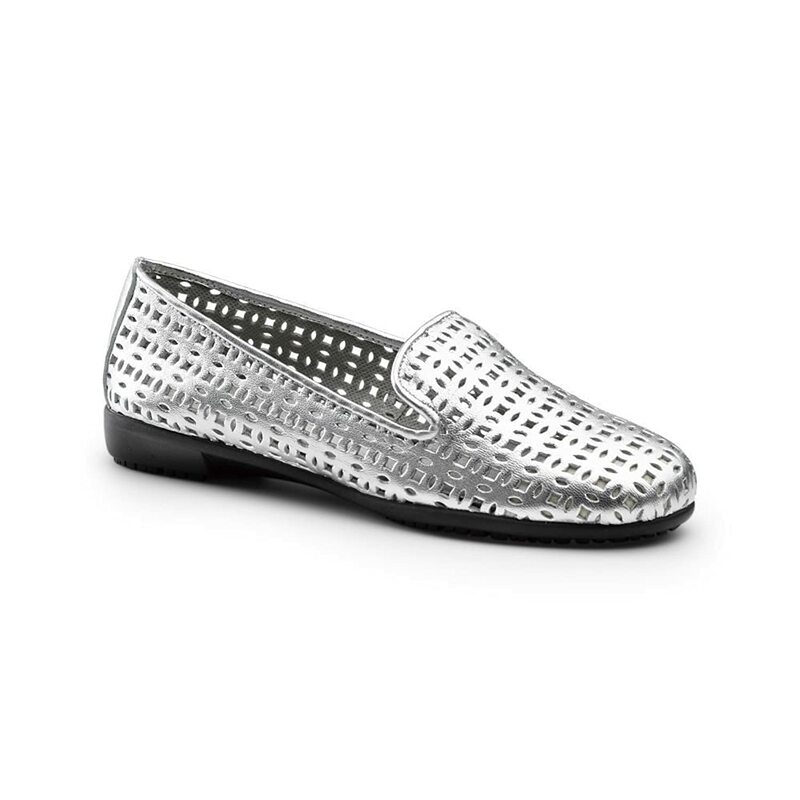 These slip-ons are a great value shoe considering the level of comfort and durability you get. You don’t find this in most work shoes within this price range. 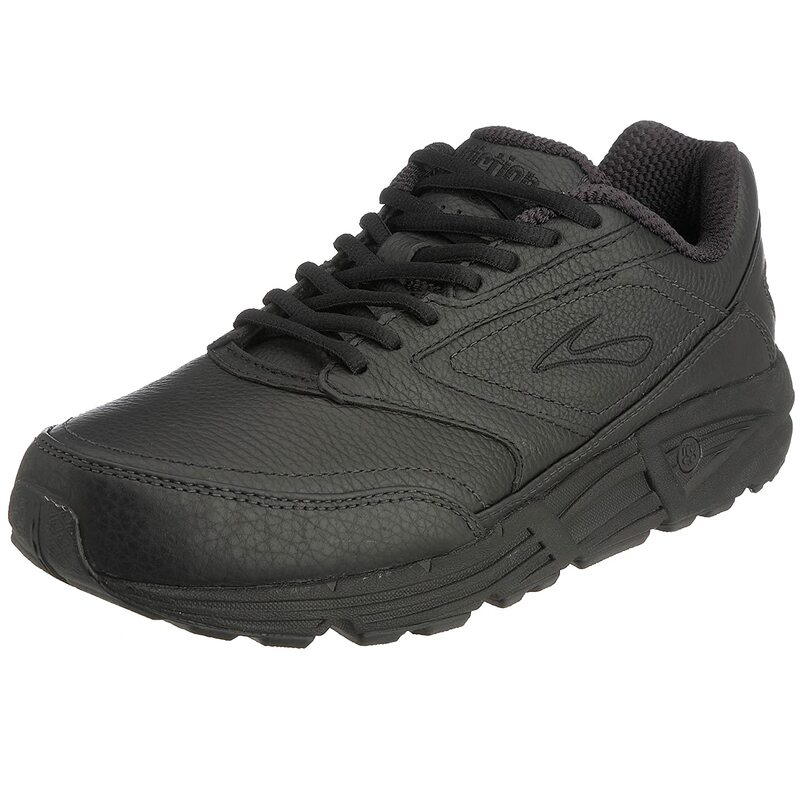 This slip-on work shoe features a mesh upper for free circulation of air to keep your feet fresh. They also have slip-resistant traction outsoles that provide you with firm grip even on slippery floor/ground. The memory foam insoles make for excellent cushioning and shock absorption for your feet. These lace-up Skechers are made from leather uppers that are durable and easy to maintain. The design of the shoes is also unmistakably stylish. You’ll also get superior comfort, maximum stability and longevity. The heel of this shoe is just about 1.25 inches and the cushioned insole is removable to allow you to adjust the fit according to your feel. These lace-ups have removable insoles that you can use to custom adjust the fit. The slip-resistant outsole means your shoes won’t let you down, even in hectic environments. Although AVIA was founded in the late 70s, this company still strives to provide customers with top quality shoes featuring the latest technology, innovation, and style. 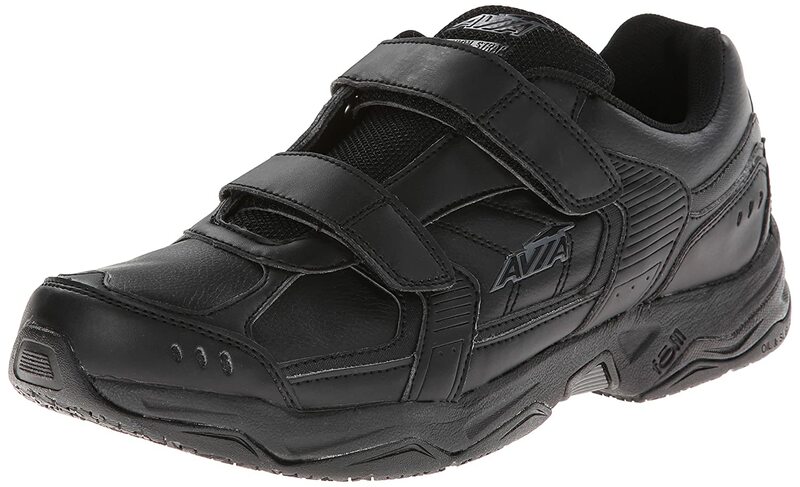 Among its many collections of men’s work shoes, the AVIA men’s Avi-Union Strap Service shoe seems to be competing well with rival brands on the market. The most interesting feature of these service shoes is the double hook and loop straps that allow you to conveniently and quickly adjust the fit. The cantilever heel design gives you unmatched cushioning and stability when wearing them in demanding conditions. The non-slip soles allow you to efficiently work in challenging environments while the breathable mesh lining gives your feet ample room to breathe. 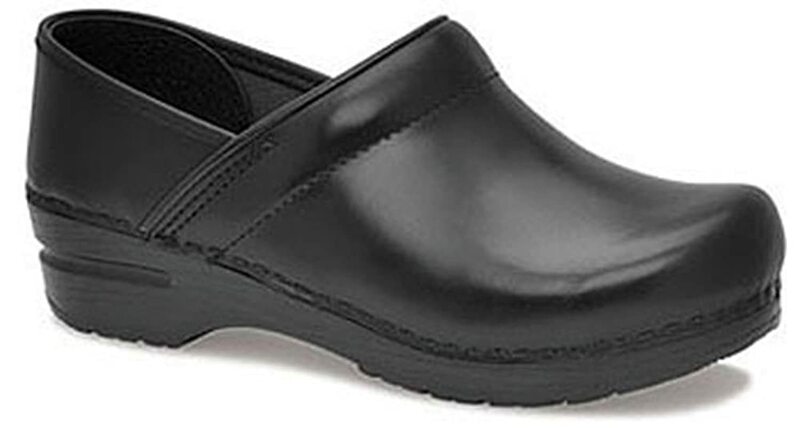 Dansko Professional clogs are one of the most popular types of shoes among nurses and chefs. Dansko makes a wide range of nursing shoes. This 2-inch heel with padded instep collar and wide heel will provide you with excellent stability and the best level of support. 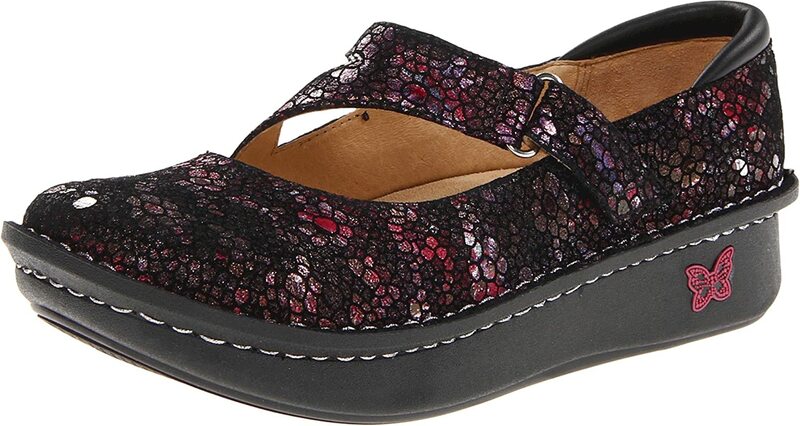 Dansko clogs are known for being roomy for your toes as well as highly comfortable. You’ll get superior arch support and stunning shock absorption. These clogs are made with leather uppers and rubber soles that are ideal for working in environments that are highly active and slippery. The smooth leather finish featured makes them easy to clean and maintain. 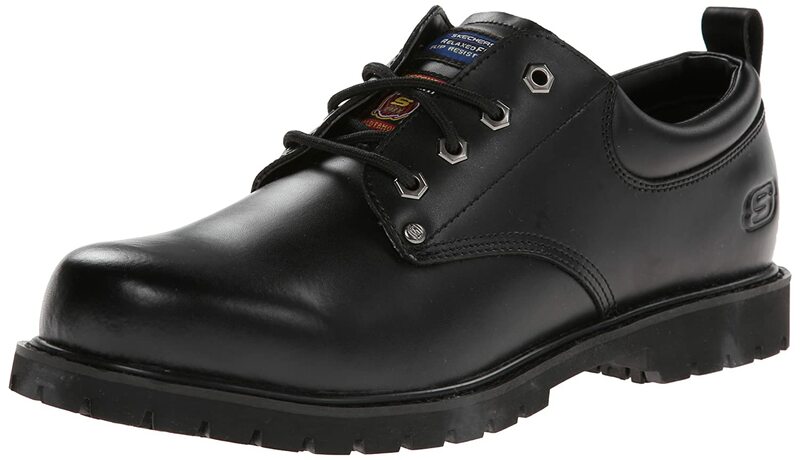 If you are a sporty kind of guy looking for shoes that suit your casual style, these Dr. Scholl's Cambridge work shoes are well worth exploration. These shoes are not just for athletes but also a great option for nurses, chefs and other professionals that stand for hours on end. The shoes are made with leather uppers and rubber outsoles that deliver comfort and excellent traction. 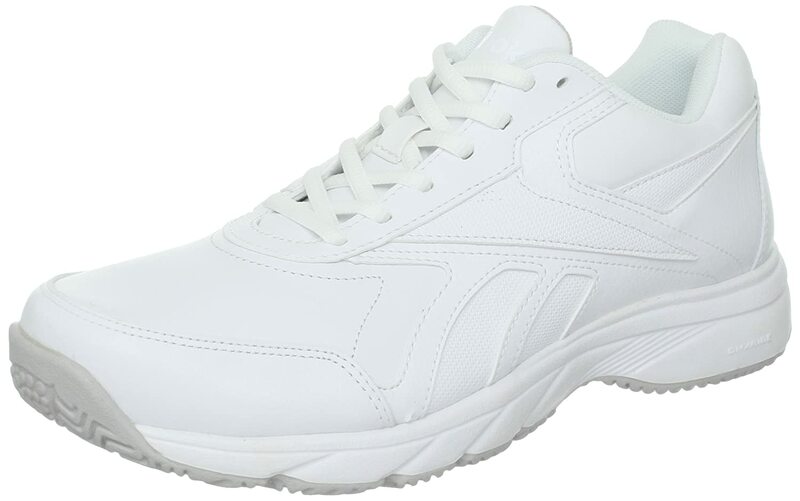 The lace-up closure with the padded tongue and collar provide you with a comfortable fit all day. Your feet will stay fresh from morning till night because of the moisture wicking lining present in the shoes. As if that not enough, Dr. Scholl’s include a massaging gel cushioning insole and slip-resistant outsoles that will help you towards a comfortable, productive day on your feet. This Romeos are one of the best types of shoes for male nurses. Georgia Giant makes a variety of male boots. These Romeos, in particular, are designed for style and durability. You’ll enjoy an enormous amount of cushioning between you and the floor providing you with comfort and maximum shock absorption. Overall, these Georgia Romeos are an excellent casual/work shoe and can be worn with any outfit. Made with protective, full grain leather, these boots are designed for durability and easy cleaning. The rubber soles will ensure excellent traction on all floor types. The boots are designed with inset elastic gores for slip-on ease. The EVA comfort midsole provides optimal comfort and shock absorption for your feet. If you are experiencing difficulty finding the right quality shoes that you can stand in for long hours, then you should give these Merrell Men’s Encore Moc Pro work shoes a try. It is worth noting that with this shoe, Merrell has upped their game. The sole is great and provides excellent traction and slip resistance. The leather uppers and rubber soles make these shoes a great option for durability and stability as well as making your long hours of standing more bearable. If you suffer from lack of breathability with your work shoes, then you should buy the Merrell Encore Moc Pro Shoes for their breathable mesh lining. This keeps your feet breathing freely. The mesh lining and the footbed are treated with M-select fresh shoe odor control that repels any bad odor. First in our list are these nursing shoes for women made by renowned brand Timberland. 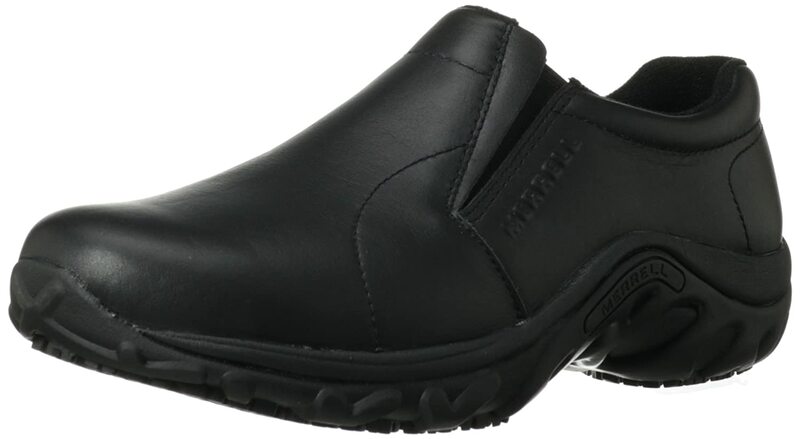 The Timberland Pro Renova Slip-on is a classic choice for nurses seeking comfy, durable footwear from a reputable, fashionable brand. This shoe is made with a quality leather upper and durable rubber for the outsole. Rubber is known to give good traction and can guard your feet from slippery floors. Its slip resistant technology is great for staying on your feet if it’s wet underfoot. These shoes are lightweight and long-lasting. The distinctive Bi-Fit Tri-density footbeds help regulate your foot temperature. This shoe’s heel can make you two inches taller. At the front, the platform level is ½” which is ideal for cushioning your foot when you walk. Since Timberland Renova is meant to be used for long stretches, it means that it can conform to your movements over time because of the soft cushion base and the comfortable shape. Aside from that, the heel to toe rocker feature puts less stress on your whole foot making you feel light with every step. This is one of the bestselling shoes on the market today. Dove shoes are in high demand with nurses. These are so lightweight that you hardly feel like you’re wearing shoes at all. You can easily insert your foot directly because it comes with no laces. Other than that, this shoe offers slip resistance because of the rubber outsole and stain and spill resistance because of the leather upper. The leather is also durable. Cleaning is fuss-free with just soap and water. The heels can boost your height about 1.5” and the platform on the front is 1/2’’ high. Women need more foot cushioning than men because of their anatomy, and that’s why Dove compensates for this by offering more padding. With great ankle support thanks to the padded collar, these shoes are the height of comfort. 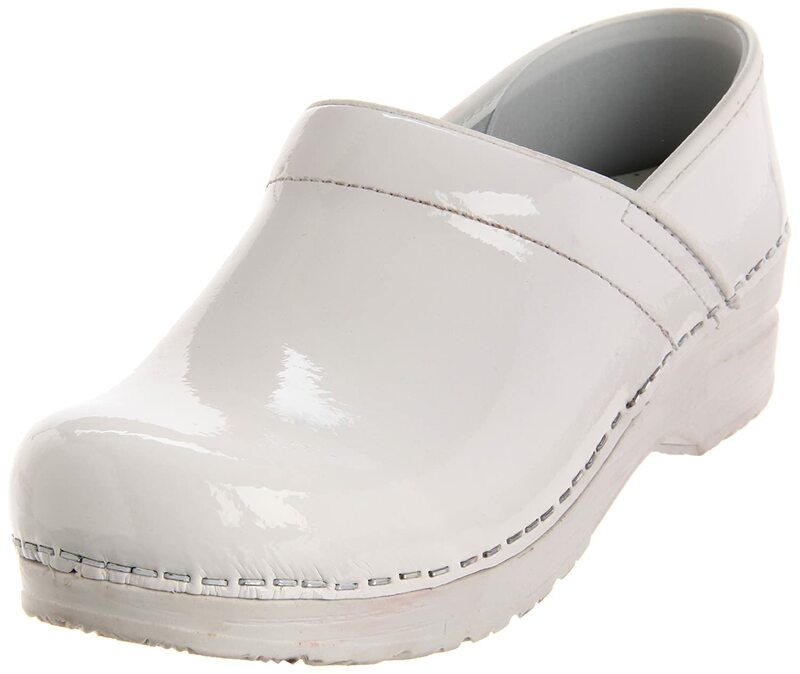 The third product on our list are some great clogs by Dansko. These clogs are fairly new on the market, but they are garnering loyal customers in no time. One of the reasons is that they are good for their feet all day. You can go one size down because this shoe has a wide toe box. The upper material is made of quality leather that lessens the chance of stains it’s nicely water resistant allowing easy cleaning. The sole is made of polyurethane which is water and oil resistant. This material makes your clogs slip resistant. The outsole heel can give you 1.5” in height, and the platform is as high as ¾”. The platform height will cushion your feet as you do your round. This product is design for nurses who have medium to high arches. Despite the appearance, the shoes are really lightweight. 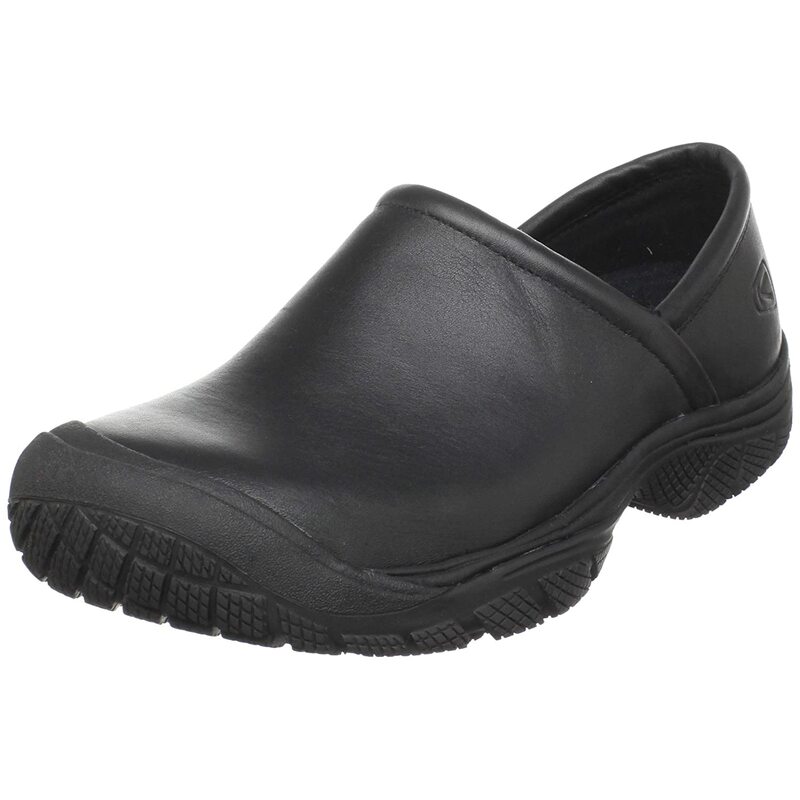 This professional slip-on shoe for nurses is made by Alegria. This shoe is a favorite among female for its style and detailing. Get the comfort and the support that you need without breaking the bank. The material used for the upper is quality leather that is stain resistant. and easy to clean. The outsole is synthetic. You don’t need to worry about slipping because this shoe prevents that from happening. The outsole is layered at the sides with an elastic material that helps make slipping the shoes on and off much easier. The product can give its wearer as much as 1.5” of additional height. Its platform front is 1” and this cradles your foot securely. Because the Alegria Debra is so lightweight, you can walk your rounds without feeling burdened by heavy feet. They are perfect for working long hours. Fortunately for women with flat feet or medium arches, this shoe is perfect because it has minimal arch support. The first athletic shoes listed here are made by the renowned brand Reebok. This shoe is “designed to deliver all-day comfort and support”. These shoes make a smart choice for those workers who are on their feet for extended periods of time. Despite being designed as running shoes, this doesn’t stop you using them in the medical arena. Reebok claims that their shoes have all of the features needed by the way of additional comfort and support for nurses. As an athletic shoe, the upper is made of leather which is lightweight, breathable and stain resistant. The outsole is made of rubber to lessen the chance of slipping. As with an athletic shoe, it gives the wearer excellent traction to be up and about at any moment. Sanita from Sweden was established in 1907. They’re known for their nursing shoes that are both comfortable and stylish. This brand is one of the pioneers in the manufacture of nursing shoes. The upper material of the Sanita is made of quality grain leather, and the outsole is rubber but has a polyurethane coating for slip resistance. The heel height lifts you an additional 1.75” off the ground while the platform is 0.75”. The reason for the height difference is the special rocker bottom technology in the sole. This technology makes your strides easier and lessens the strain on your arch. The Sanita are extremely lightweight shoes, perfect for people who work long hours leading to swollen and heavy feet after wearing the wrong shoes. This shoe provides the support that you need despite its weight. The good news for every woman is that it works well with all arch types. For men’s nursing shoes, they should be of high quality. These work shoes from Merrell are comfortable and durable as well as reasonably priced.The full grain leather upper is waterproof and easy to clean. The outsole is made of rubber and rubber is known to be highly slip resistant. It can stop you from slipping in wet corridors. The slip-on design is a superb time-saver. The heel is 1” off the ground. The internal lining comes with an Aegis antimicrobial solution that prevents odor-causing bacteria from thriving in your shoes and so keeping you cool. Since the cushioning in the heel absorbs shock, it adds stability and effectively supports your weight. It also prevents other foot conditions. The comfort footbed is removable if you want to insert your shoe insoles. This product is made with comfort and safety in mind. 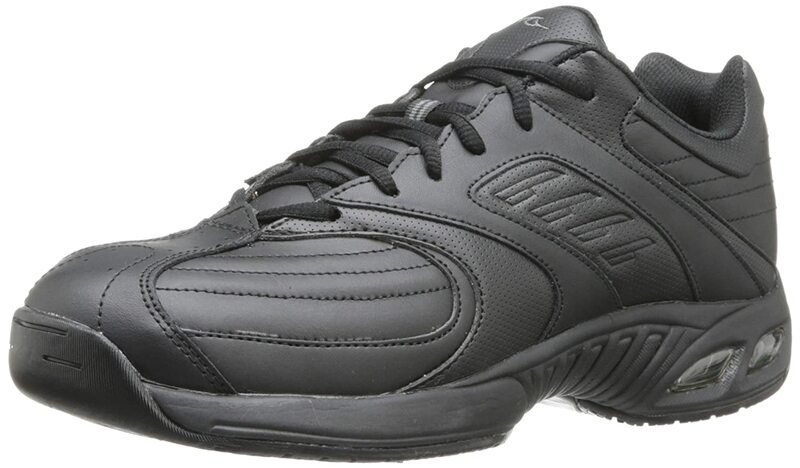 Keen is a prominent brand for men’s nursing shoes. Even though the market is dominated with nursing shoes for women, there are also plenty of male nurses looking for appropriate footwear. 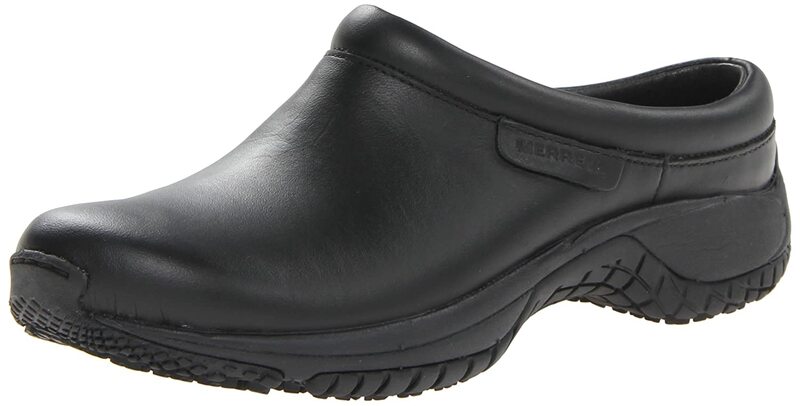 Male nurses prefer black nursing shoes and that’s why Keen currently has only one color. They may seem slightly expensive but they are outstanding overall value for money. The upper is constructed with leather that is stain resistant and waterproof. It is also easy to clean and very lightweight. The outsole is made of rubber known for anti-slip properties. Keen is also ASTM certified for its non-slip testing standards. Keen also provides a large toe box meaning you can move your toes freely with extra room if your foot swells later in the day. The toe box prevents work-related incidents because of the protective design. Other than that, the leather lining at the entry of your foot regulates the foot temperature and keeps your foot cool and dry. The footbed is made of polyurethane, cork and memory foam that makes your foot more comfortable. 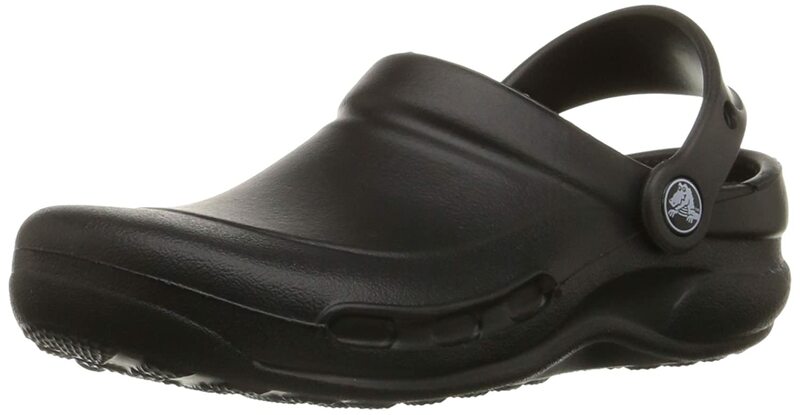 The Crocs Company offers clogs perfect for nurses. If you want a roomy space for your feet, Crocs is a good brand to test out. With comfort and support alongside a spacious fit, Crocs tick all the boxes when it comes to shoes for nurses. The shoes are made from croslite. This provides maximum comfort and conforms to your foot. Because of this material, your Crocs are odor-proof. It is also easy to clean with just a wet towel. Because Crocs are roomy for your feet. They are also equipped with back straps so that your feet will not slip out. Aside from that, it gives plenty of room for your foot swelling because the foot becomes larger at the end of your day. Arch support is very good for this product. The outsoles prevent trips and slips. The insole gives you a massage-like sensation that makes you feel relaxed. Finally, the top is thicker so it can protect you from spillages. The last product to be featured here is a brand and model fit for male nurses. Though they are athletic shoes, they can also be used as nursing shoes. Brook is known for excellent cushioning and shock absorption due to the MOGO midsole and forefoot Hydroflow. This shoe has a full-grain leather upper that is soft to the touch but also stain resistant. Its outsole is made of rubber so you’ll have less chance of slipping. The padded collar and interior lining increases comfort and are anti-moisture to keep sweaty feet at bay. Why are nursing shoes unique? Nursing shoes are designed to be light, and to help you walk more easily with lighter steps. They generally have outsoles that prevent slipping on wet surfaces. Nursing shoes come in a widespread variety of designs and style. The design may vary from institution to institution. We give you the most common types seen in most hospitals. A standard nursing shoe must be closed shape because the hospital is a formal establishment, and also it’s part of the uniform. Common colors are black and white although many brands offer a wider palette. Sneakers or athletic shoes are best for workers who stand all day in a fast paced environment, especially nurses. They are lightweight and help you to move more quickly. If your hospital management allows you, you can wear this type if you suffer from foot conditions like plantar fasciitis. Nurse sneakers are more commonly known as running shoes or nursing tennis shoes. Sneakers are great because their continual usage provides long-lasting comfort. They are perfect for hard floors because their outsoles prevent you from slipping. They also have shock absorption technology that absorbs stress from the extensive pressure you put on your feet. You will thank yourself with these because you can work for extended periods of time. Depending on the design of the athletic shoes that you’ll buy, you can have them laceless. You can get additional benefits such as ankle support, cushioning, and good insoles. 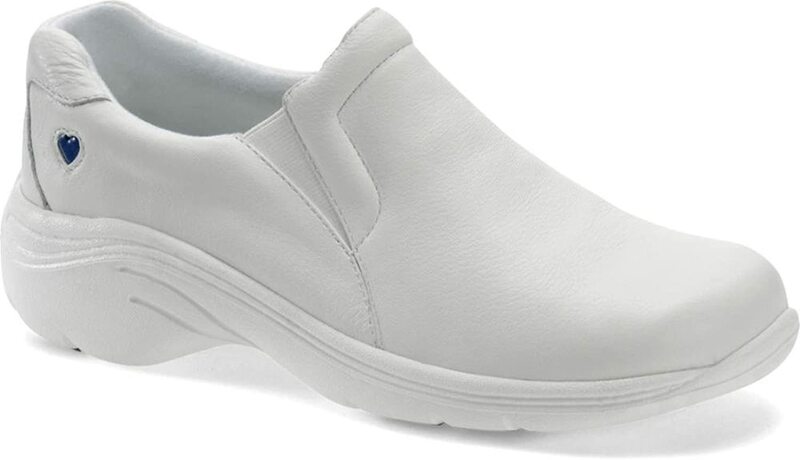 Slip-on shoes are an excellent choice for nurses. They’re shoes with simple designs that allow your feet to slip directly without tying up laces. They save lots of time. With no laces or straps, you avoid the risk of undone laces that can get caught in edges. They’re also easy to clean. just wipe them with a wet towel and allow them to air dry. These shoes are also called loafers. Slip-on shoes gave you security because they have a solid back, unlike clogs. Slip-ons are comfortable and reliable footwear for nurses. Also, they are universally fairly cheap. But be sure to find a pair with the required comfort and support. Clogs come in many different designs. One example of clogs that was popular was Crocs. They are pretty common and can make your feet look stylish. Clogs help out with sweaty feet as they offer ideal ventilation. Clogs also provide pressure point relief and promote good posture. They are mostly made of rubber, making them light for your feet. They are a popular choice for nurses because of the comfort they provide. However, be careful when wearing clogs. Your foot can slip out of the back part if it doesn’t come with straps. This kind of material is typically used in athletic shoes. This is good for your feet because it makes the shoes more lightweight and breathable. However, if you work in an environment with hazardous chemicals around that can spill, you may not want this synthetic mesh to come with your nursing shoes. They do not protect your feet from spillage and may absorb the harmful chemical that will injure your feet. Nursing shoes made of leather are good for your feet especially if you work with chemicals. If a chemical accidently spills on your shoes, wearing leather shoes could save the day. But they can be difficult to clean. Leather also keeps your feet from sweating. Nursing shoes made of rubber are the best for protection against chemicals. Avoid shoes with holes as they won’t protect your feet even if they’re made of rubber. Also, be informed that this type of material is not that supportive of your feet. It is crucial for all nurses to wear the right shoes for the job. You’ll want support and stability along with flexibility. If you’re on your feet for long stretches of time, you’ll need your feet to be at their best. The primary purpose of a nursing shoe is to provide long-lasting comfort, especially if you are standing all day. If you deprive yourself of comfort, you will lose focus on your work and make mistakes. Also, it leads to other foot problems like plantar fasciitis. Be sure that your shoe has cushioning to add extra comfort. Aside from cushioning, other parts of the shoe can provide comfort depending on the construction, such as the heel box, arch support, and the toebox. Of course, you buy shoes that will fit you. But don’t forget that since you work long hours, there is a good chance your feet will swell. Make sure to choose a pair of shoes that is at least one size bigger than your feet. You may want to consider that you might also be wearing thick socks that can add a few millimeters to your footstep. Best advice available in choosing the right size is trying on pairs at the end of your day because the feet tend to get larger at that time of the day. Look for something that’s roomy enough but not so big your foot will slip out. If you’re slightly heavy, you may want to buy shoes that have extra cushioning and shock absorption for added stability. Be honest with yourself and if you’re carrying any excess weight, take measures to counteract this with cushioned shoes. Hospitals are fast-paced environments, and you don’t want to walk quickly on corridors and slip up. Rubber or polyurethane outsoles are perfect for gripping purposes. If the outsole has a distinctive pattern, when it contacts the floor it will help hold you upright. Use materials that are easy to clean like leather and rubber. Rubber is very simple to clean. The downside to it, however, is it is less comfortable and less breathable than leather. Sweaty feet mean bad odor and your shoes deteriorating prematurely. When buying shoes, examine the breathability that they provide. All people have varying arch types. It may be high, medium, or low. Know what arch type you have, using a simple test – the wet foot test. After you know how high your arch is, you won’t waste time checking all nursing shoes to find what suit you best. Some shoes specifically tell the buyer if they support high arch or low arch. You already know that as a nurse, you need to use shoes that live up to your job description. Examples are long shifts and hasty movements. Nursing shoes should be easy to clean, and should be more hygienic than ordinary shoes. But, depending on your work type, you can change shoes. Do you mostly sit, stand or lift heavy objects? If you’re sitting, you can use more comfortable shoes that keep you relaxed when they touch the ground. Look also for slip resistance and traction. If you have any foot problems, like plantar fasciitis, you will need to take extra care of your feet. Nursing shoes are designed to be comfortable but do they target your plantar fasciitis? Get a pair that has removable insoles and buy newer insoles that specifically aim to comfort your plantar fasciitis. There are reviews of all foot conditions available online. White and black are the most common colors traditionally. Some nurses like black because the dirt won’t be very visible unlike when they wear white nursing shoes. But there are also nurses that like white because it emanates hygiene and the right image. Other colors are sometimes permissible as long as you meet health and safety standards. Price for nursing shoes can spike higher if it’s a reputable brand. Some may immediately go for those brands because they’re tried and tested. They’re expensive because of the material, features, and also the name. Statistics shows that an expensive shoe that is made of high-quality materials lasts at least two times longer than the pair of shoes you buy at a cheap department store. This also means that you save at least twice the money if your cheap shoes give up on you in a few weeks. There’s nothing wrong with investing in a good pair of high-quality nursing shoes if it’s for the benefit of comfortable working shifts. It’s a given that if you want shoes made of leather, you will have to hand over more dollars than the usual synthetic mesh and rubber shoes. The field of nursing is generally dominated by women though there are also enough men. This is the reason why most reviews for the best shoes for nurses are targeted at most women. There are significant differences in knowing the variances of a man and woman’s nursing shoes. First is the anatomy of a man and woman. A man has wider and larger feet than all women. Second, designs for a woman’s shoes are more distinct than men (though all should be plain-looking). Even the best shoes for nurses don’t last forever. They’re just like any object that wanes over time with over use. If replacing insoles can’t help the state of your shoes’ degradation anymore, it’s time to buy new nursing shoes. The average life expectancy of nurse shoes is six months or 500 miles for runners. Those who weigh more will need to change their shoes earlier than four months. If a nurse continues using degrading shoes, their health will be at risk and they can develop problems later. Nurses who already have problems will further develop more serious problems. Good shoes should go with good insoles. They’re like the ketchup for your French fries. Insoles are cushion covers that provide more comfort and maximum support aside from the qualities that your nursing shoes provide. Insoles are also good shock absorbers because they’re made of foams or even gels. When buying insoles, the guidelines are pretty much the same as for buying nursing shoes. If you’re new to insoles, there are articles available that will answer your questions. Investing in a good pair of socks is vital. Pick a brand that will regulate your blood flow effectively, keep you warm, comfortable and moisture-free. Socks are like another layer for the protection of your feet in a cold area. Buy socks made of cotton or wool. Do exercises that target the lower limbs of your body, particularly from your knees to your toes. Exercising is good to stretch your muscles and it lessens your chances of having injuries and foot problems. Exercising also improves the strength of your bones. It also has other major benefits for your body. Break time in between your shift is good for your feet because it relaxes the pressure that was on your legs, joints, and ankles. You should take breaks like sitting every hour so your muscles can recover. There are several tips for people who stand all day. Depending on your working environment, you can put some more seats out so that there are more places for sitting. You should also try to shift your weight from one side to your other side. And stand with one foot in front of the other foot because it can reduce the fatigue you’re feeling. We hope you have enjoyed this collection of reviews and tips. For a nurse like you who knows that your feet are one of your most valuable assets, you should have quality shoes that will fit you like a glove. The best shoes for nurses like you will provide many benefits and more comfort in the long run. Feel free to contact us if you want any advice or if you have any feedback. Now get the right shoes for the job!